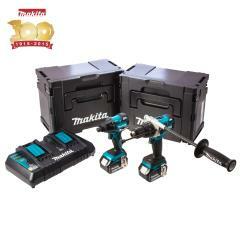 This Metallic Blue Limited Edition Combi Drill and Impact Driver Kit from Makita is in celebration of their 100 Year Anniversary in 2015 since they started doing business in 1915. The Makita DLX2040SPE is a Cordless Twinpack featuring DHP481 Combi Drill and DTD129 Impact Driver, both machines coming with brushless motors. Add the 5Ah batteries to this and what you have is a couple of machines with unprecedented runtime.